The brewing space is getting busy in Roswell. We could potentially have three brewers in Roswell in 2016. Gate City would be tough to miss given their prime spot at the corner of Canton Street and Magnolia in the Old Roswell Automotive spot behind Pastis. Something is definitely brewing next to Pasti's in Historic Roswell. You can find their beer, currently brewed in Woodstock at Reformation Brewery, at several establishments in and around Roswell and they should begin brewing in their home base before the year is up. I've had several of their beers (I'm partial to Copperhead Amber) and they make a quality product. Finally, there is Green Street Brewery (that may or may not be the actual name) which is being proposed for the empty gravel parking lot behind the fire station in Historic Roswell. I don't know much about this one other than the building that was approved by HPC on 10/14/2015. I'm definitely excited to see a quality building being proposed and the fact that it's a brewery helps too. On a side note, I think Green Street may be in for some attention and this property may be a catalyst for that. So, high quality local brewing looks to be coming to Roswell very soon and I'm pretty excited for it. Time to grab a beer! I wanted to make my readers aware of one of my other efforts that is going on here in Roswell next week. RoswellNEXT holds periodic events around town that focus on issues and topics that matter to Roswell. This month, on 8/22, we are hosting Town Hall | Roswell: Dining Out. It will be a panel of five restauranteurs from Roswell and they will discuss the dining scene in Roswell and North Fulton. It should be an excellent event. Town Hall | Roswell is a unique event that brings our city together to learn about and discuss issues and ideas that are important to the future of our city. This month, we are fortunate to have a top notch panel of local restauranteurs to discuss what's it's like to run a restaurant in what has become one of the best cities to dine out in the metro area. Our panel will include Ryan Pernice of Table & Main and the soon to be open Osteria Mattone, Marc Wegman of Adele's Authentic Cajun Cuisine, Jack Gerbilick of the Food Movement and Rich Clark of Hugo's Oyster Bar & C&S Seafood. Our moderator will be Steve Stroud of the Roswell Business Alliance. You can expect to learn about what it's like starting a restaurant in Roswell, how Canton Street has redefined OTP dining, how food trucks are impacting business and what the best dishes in Roswell are. Additionally, we will have some special treats on hand from some local restaurants to satisfy your appetite while you listen to all the talk about great food. We will also be helping out a local charity with food donations. Bring 10 canned goods and receive free admission. Donations will go to the North Fulton Community Charities. 2013 Outlook - What Will the New Year Bring for Roswell? 2012 Recap - Keep up the Good Work Roswell! Last year was another great year in and around Roswell. Here are some of the more notable stories. Groveway Hybrid Form-Based Code - The city passed the hybrid form-based code which was a huge move in the right direction for human-scaled development. DPZ Master Plan - A MP for Historic Roswell was completed by the innovative and influential firm DPZ. This MP wasn’t adopted officially by the city. However, the ideas generated from the plan, in classic Andres Duany form, have generated momentum to change where there was none before. TSPLOST Fails - The hopes for easy money and quick upgrades to infrastructure faded as the TSPLOST referendum went down in flames in July. Roswell lost out on a complete renovation of Holcomb Bridge/400 ($46M) and full funding of the Historic Gateway Project ($21M). Historic Square Upgrades - Some nice additions were made this year by completing the sidewalk network in and around the square and also putting up traffic light masts that match others around HR at 120/9 intersection. Info Kiosks - We finally got some content added to them and they look great. Little Alley Steak - The guys behind Salt Factory and INC opened their third concept and it’s fantastic. One request though guys, dress up the bathrooms. Pure Taqueria - The Alpharetta based chain has opened a spectacular new location just north of the Historic District. Alive After 5 Canton St Closure - The world did not end! This was a needed change for the popular event. Food Trucks - We approved a food truck ordinance and now they are regulars at Alive After 5. Awesome addition. Alive at the Square - The Alive After 5 party migrated south this year and was very successful at the Historic Square. This spot allows for a little more space and is really good for families. Pedicabs Approved - In a move that I’m not sure was necessary, a hypothetical business would be able to run pedicabs in the Historic District. Eventually, this will be cool. Bond Referendum Passed - This was a mixed bag but overall was good for walkability. Fire Engine Red on Canton Street - In a controversial move, the new tenant of the former Pastis location, Mac McGee, painted the entire facade fire engine red. I love it. Now can we get rid of those ugly black awnings with the block lettering? Just a horrible look for Canton St.
Beltline Eastside Trail - Opened in Oct and is AMAZING! We need to model the Roswell Loop after it. New Falcons Stadium - Completely unnecessary. Go Falcons though! Ponce City Market - Going to revolutionize in-town living. Avalon Site Plan Approved - Alpharetta eating our Lunch. Alpharetta City Center Plan Approved and Funded- Alpharetta eating our Lunch part 2. Sandy Springs City Center Plan Approved - This is a very nice master plan done by new urbanist firm Goody-Clancy. Food Access - One of the biggest obstacles to making the Historic District a vibrant living spot is the lack of a walkable or bikable grocery store. Last year, we thought there might be an announcement sometime in 2012 about a small(er) grocery store going in somewhere near the HD. We did get something but it wasn’t exactly what we were expecting. It came in the form of a request to demolish the property at 1056 Alpharetta Street. The owners are looking to build a small gourmet grocery store called Baba’s Gourmet. We don’t have any additional info aside from what is in the notes from the HPC request. The new building will be a welcome addition and will improve the streetscape along that stretch. Restaurants - We have several exciting restaurants opening up around HR in the near future. MacMcgee Irish Pub will be opening in the freshly painted former Pasti’s location on Canton St. Soccer fans rejoice! Borocco is building out space in the Chaplin’s shopping center. I’m hoping this one is successful to add a little life to my immediate neighborhood. On the other side of the square, the owners of McCray’s Tavern (Smyrna & Lawrenceville) are opening a restaurant in the old Relish/Pico spot. I’m a little unsure of the name since the HPC modifications request is under McCray’s Tavern but the liquor license was applied for as The Mill. Either way, that spot will be solid with the right concept. Osteria Mattone is the new venture on Canton Street from the guys behind Table & Main which in my opinion is the best restaurant north of Buckhead. I have a bold prediction that Oteria Mattone will jump into at least one of the top of Atlanta lists in 2013. Just seeing the pics on twitter (@oteriamattone) from their food scouting trip in Italy is making me hungry. We reportedly have two of our home grown restaurants, Salt and Nine, making the jump up to Alpharetta with second locations. Salt will be in the old KFC location on Main St and Nine will be in the former Bistro 52 location behind Mitties Cafe on 9. Honestly, I don’t like either of the locations. I think Salt will be successful due to the name recognition and the food quality. The success in Roswell has partly been due to fact that they have an Incredible location in the most walkable part of our city. We believe, Nine will miss the mark. The food quality is suspect and that location doesn’t have the foot traffic that is required to sustain a restaurant serving marginal food. Locally Grown Food - Will 2013 be the year that we get a real community garden in the Historic District... maybe at Barrington Hall? Farmer’s Market - The Saturday farmer’s market at City Hall formerly known as the Riverside Farmer’s Market did well in 2012 and we think the same will hold true in 2013. Although, the fact that it is in a parking lot is a huge turnoff. If they could somehow find a way to move it to one of the parking lots right along Canton Street, the visibility would be huge and potentially bring even more vendors. The only other suggestion I have would be to move it to the circle in front of the steps at city hall. Most people who shop at farmers markets are inherently interested in sustainability and it is counter-intuitive for those people to feel great about shopping in a parking lot. Just saying..
Sidewalks - We are slowly but surely connecting missing teeth in our sidewalk network. We will connect Diesel to Canton St with a sidewalk along the north side of Norcross Street early this year. Not that anyone really walks there but the gap in front of the self serve car wash on the west side of Hwy 9 just south of Holcomb Bridge will get a sidewalk either this year or next. Historic Gateway Project - Option 3a will be approved and the people at Creekview Village condos will go berzerk because they will lose their tennis court... The anti-roundabout camp will come out in full force and there will be a prolonged battle to get this redevelopment project going. The truth is, this design has the potential to be truly transformational for the HD. However, one thing that is a MUST is on street parking. We'll probably know this year whether GDOT will allow that. If they don't, everyone should oppose this option as it won't work. Building a Network - Work will continue on the plans for the Oxbo Rd realignment and Elm Street Connection to Oxbo. However, no actual work will start for another couple of years. We are very excited about this initiative. Additional talk will occur about the Oak St extension through Waller Park to connect with Grimes Bridge. Bridge over 400 - We will see some designs at some point in 2013. Historic Gateway Master Plan - The DPZ plan that was completed in 2012 will serve as a guide for other projects, see below, that will come out in 2013. The DPZ plan will not be followed completely rather, it is serving as inspiration that was not there before. Unified Development Code - We have a top notch firm in Code Studio helping us put together our new UDC. We think the public will get its first glimpse of a ‘finished’ product toward the end of the year. This will revolutionize development in Roswell. There will be several meetings that the public can attend throughout the year. Downtown Development Authority - The DDA will finally bring a big project to the table. Maybe something around Canton Street and Highway 9. Boutique Hotel - It is becoming more and more obvious as Historic Roswell becomes a more popular destination that we are severely lacking in quality lodging options. Is 2013 finally the year that a big hotel group takes note and steps in to build the boutique hotel concept? We think that’s still a few years off. However, a more likely scenario is a B&B opening in the Canton St area. Alive After 5 - The expansion to the Square was a big hit in 2012. Especially for those with smaller children. This year, the proximity to McCray’s tavern will make the Alive at the Square piece even more fun. The Food Truck addition made a big deal and enabled people to go to the event and eat there rather than having to leave early due to restaurant overcrowding. This event is a cornerstone for years to come. RoswellNEXT - This newly formed civic group will host 12 events for members and the public in 2013. We think it will be a huge success and the Town Hall | Roswell events will prove to be innovative and informative. By the way, they are having a fundraiser on Jan 31st. For more information go to their website (www.roswellnext.org) or their Facebook page. Charlie Brown Part Deux or Trois?- Nothing will happen that is large scale on the old Charlie Brown parcel on the southeast corner of 400 and HBR. We will continue to hear of plans to bring MARTA to exit 7 and beyond but nothing beyond dreams will materialize. Riverside Park Area - We thought this would move faster but we believe in 2013, plans will be finalized for two projects.. the extension of the riverside trail will be approved despite NIMBY andEnvironmental Concerns. The design plans for the bike/pedestrian bridge over the Chattahoochee River will be finalized and approved. Roswell Area Park Rebranding - An effort will be initiated to rename Roswell Area Park. What in the world is an “Area” park anyway? Ace Sand Company - Something will happen with the property currently occupied by Ace Sand Company. This has huge development potential and could be a great addition to our park system. A Little Movement - We don’t need ANY more thrift shops. I think we’ve reached saturation in that market. There will be some strip center renovations finishing up in 2013 and we might see some announcements for more in the midtown area. I’m thinking we will hear something about the Southern Skillet shopping center. That’s purely a hunch but I’m keeping my fingers crossed. Small Business Incubator - We feel that the best opportunity for Roswell exists in cultivating smaller startups. Alpharetta a lock on large corporate IT. Dunwoody, Sandy Springs and Buckhead have a stranglehold on large and mid-size companies. The opportunity here in Roswell is to leverage the strengths of our neighbors and work to create smaller businesses that are not as prevalent in the neighboring areas. We have an atmosphere that is much more desirable to that demographic. But, we need to nurture it. A full fledged startup incubator in Roswell would work but it would need the support of the city and partner organizations. I don’t see it happening in 2013 but it could. Housing in the Historic District - There will be at least three projects announced in 2013 that will bring new housing stock to the historic district. These will be in the form of single family homes, townhouse and even apartments. Development Revitalization - Several developments will get new life. We are guessing that there may be some action on foreclosed Vickery Falls development just south of Chaplain's on South Atlanta Street due to the prime location and the added focus on cleaning up the area around the square. This could push out into 2014. Goulding Estate for Sale - The $8.75M, 16 acre Goulding Estate didn’t move last year as expected. However, when it does in 2013, the land will be subdivided into ridiculously expensive smaller lots. We think the the original building will remain intact and potentially become another event facility or potentially a B&B. The bigger question is whether they will figure out a way to connect the road to the road to the west and build out our network, more. The Beltline - We predicted correctly that the eastside trail would be a huge hit and when it opened in Oct of last year, it was an instant success. News about additional funding for the Beltline transit component will come out toward the end of the year with a public-private partnership being the finance tool of choice. The Stadium - The stadium will be approved and ground breaking will occur in early 2014. Ponce City Market - Additional shops will open up in Ponce City Market. The unfortunate decision not to offer for sale units will not hurt the overall speed of the development and may actually increase it. However, this will prove to be the ultimate saturation of the apartment boom in that area. Avalon Alpharetta - Ground breaking will occur in January. The parking deck will come down quickly and we will see actual structural development in 2013. It won’t be ready for showtime until late 2014 though. Alpharetta City Center - The new configuration of Haynes Bridge Rd from Old Milton to Academy St opened recently making way for the new library. We will see work start on the Library and City Hall in 2013 and the new road grid and parking deck will begin to take shape. We love this project. Sandy Springs City Center - The plans have been approved and we will see a small bit of development start in 2013 but the bigger changes will start to become evident in the next 2-3 years. The Atlanta Streetcar - Love it or Hate it, construction will be almost complete by the end of the year and we will see streetcars rolling through downtown again in early 2014. The Multi-Modal Passenger Terminal (aka The Gulch) - We will see the final renderings will be approved this year and work will start in late 2014. Old Malls Will Close - We think at least two malls in the metro area will close completely this year. Crazy we know but retail is getting crushed by Amazon and aside from the half-dozen high quality malls around the region, the mall is dying. Well, that's it! If you made it this far, you're a true NUR fan. Thanks and have a great (rest of) 2013! Roswell is about to reach a milestone. Our dining scene is now healthier than ever. How do we know this? We are about to have our fifth McDonald's location! If you haven't had a chance to see one of the other four, this is what the new one will look like. It will be at 600 Crossville Rd in just the right spot to snag some hungry cars for its drive through. Happy Meals for Happy Motoring Roswell! Roswell passed its first Food Truck ordinance earlier this week opening the city up for business to Food Trucks. So, this seems like as good of a way to introduce Food Trucks to Roswell as any to introduce them to Roswell but it's at Harry's Farmer's Market Alpharetta with a Roswell address. So, technically it's in Roswell but by address only? Anyway, we can ponder that another time. This weekend's Food Truck Rodeo (much tastier than a goat rodeo) will be held in their parking lot this Saturday, March 17th to celebrate Thompson Farms receiving the first ever 5+ rating on the Global Animal Partnership Animal Welfare Rating System. Each truck will be featuring a menu item cooked with food from Thompson Farms. This should be tasty. You may know that the city recently approved a food truck ordinance. We decided to take a look at the ordinance to see where we might see some food trucks. The mobile food vendor shall not conduct business or operate under this article on the public right-of-way. The mobile food vendor shall not operate on any private property without the prior consent of the owners. Mobile food vendors shall be located a minimum of 200 feet from the main entrance to any eating establishment or similar food service business unless just eating establishment grants written permission for the mobile food vender to be located closer than 200 feet. Mobile food vendors shall not be located within 15 feet of any street intersection or pedestrian crosswalk or 10 feet of any driveway. Now...Our thoughts on Food Trucks... For the most part, they are a fad. But, when done properly, they can be excellent incubators of successful food concepts. I think there will be some in the Atlanta area that stick around for years to come. Check out the Atlanta Street Food Coalition's list of area vendors here. Most of them will probably die out. That being said, There are some killer concepts out there and it would be nice to see some in the historic district especially when we have festivals going on. Taking into account the 200 foot barrier, here's where we think you may see some set up shop in the coming months (we didn't factor in the 15 foot radius from intersections/crosswalks). 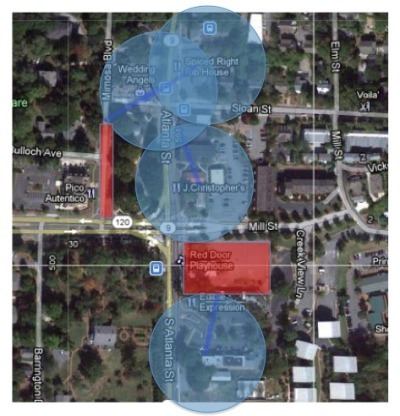 The red spots are the most prime areas where trucks might be able to set up shop. We are huge proponents of healthy eating and shopping at the Farmer's Market is definitely something we love to do. Unfortunately, we don't make it out nearly enough. Competing demands on Saturday mornings. The music is a nice touch and there are always friendly vendors with good, tasty food. The Location. Sure it's cheap for the city to have it at City Hall and yes there is plenty of Parking. However, it just doesn't get the visibility. If you want to attract the casual shopper, it has to be visible. The move from Riverside Park was a step in the right direction but it's still not quite where it needs to be. If it were me, I'd figure out a way to have it right at the intersection of Canton St and Hwy 9. That's where the life is and there's not a better place to catch the eye of a driver passing by. If that's not doable, the square would probably do nicely as well. Compare our Farmer's Market to the Alpharetta Farmer's Market and you quickly see that we have been one-upped by our neighbor to the north. Although they do have it in a parking lot, it is in a highly visible location and they now have a fantastic sign there to advertise to all passers by that the Farmer's Market is there. It gives it a feel of permanence that ours doesn't have. Also, I could be a little behind on this but I think ours is still called the Riverside Farmer's Market. We should probably change that. Maybe the Roswell Farmer's Market. Neighborhoods can either stay the same size, and see local retail gradually decline as online shopping grows and DC adds big box stores. Or, they can add enough new residents to support new retail options. Most of us prefer the latter. Some people, though, want to stop new residents but also have the retail. That's completely unrealistic. I'm a huge proponent of getting a gourmet grocer or a Trader Joe's into downtown Roswell but until there is a critical density of people living in the downtown, historic center, we won't have that type of shopping option. The perfect spot for one would be when the parcel where Value Village and Souther Skillet are locate gets redeveloped.